Located in the mountainous Shayan region, this 3-star hotel sits on the left bank of the River Tisa. Guests enjoy a swimming pool, sauna and free Wi-Fi. All simple, comfortably furnished rooms at the Blagodat feature a satellite TV, telephone and private bathroom with shower. All rooms also offer a balcony with scenic views of Shayanskie Lake and the Shayan Mountains. A breakfast is served every morning in the guest rooms or in the Blagodat’s dining hall. Guests can enjoy a variety of traditional Ukrainian and European dishes at the restaurant and relax with a drink at the Blagodat’s bar. The Blagodat offers an outdoor terrace with barbecue facilities, children’s playground, mini library and a games room with darts, billiards and table tennis. Therapeutic horseback riding and a rental bicycle service for exploring the surrounding area are also offered. Blagodat Hotel is ideal for scenic day trips, including Solotvyna Lake and the Salt Caves, 60 km away. 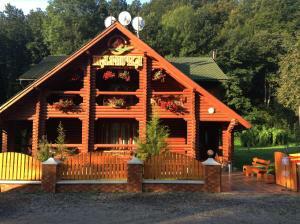 The Museum of Honey in Mukachevo, a 90 km drive, is also a popular tourist attraction. 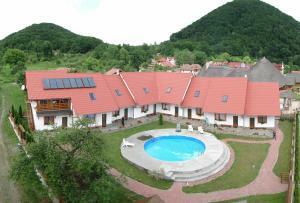 Surrounded by the picturesque Carpathian Mountains, this hotel is set in the village of Shaian. An outdoor pool, a spa centre with a sauna and a tennis court are featured at Sanatoriy Karpatia. The bright rooms offer warm-coloured, wooden interiors and country-style décor. Each room and cottage includes a flat-screen TV, a minibar, a balcony and a private bathroom with a hairdryer and bathrobes. The on-site restaurant serves Ukrainian, Hungarian, Romanian and Slovakian cuisine, and offers a selection of grilled dishes. Phyto bar, live music and barbecue facilities are also offered. Balneological treatment programs are offered upon request. Guests can also play table tennis, billiards and darts, or work out in the hotel’s gym. A children’s playground is available for young guests. The town of Khust with its Castle and Khust Bus Station are 12 km from Karpatia Sanatorium. Uzhgorod International Airport is 130 km from Sanatoriy Karpatia. Hotel Maramorosh is located 1.5 km from the centre of Shaian village, in the quiet picturesque area. It features a garden, children playground and games room. Free Wi-Fi is available throughout. Featuring classic-style interiors in warm-coloured tones, the rooms are equipped with a TV and fridge. The private bathrooms come with a hairdryer. Guests are welcome to visit the on-site restaurant, play billiards and table tennis. The barbecue facilities are also available. The distance to Khust Train Station is 20 km from Hotel Maramorosh, and Uzhgorod Airport is 120 km away. Offering an à la carte restaurant and panoramic mountain views, Erney Laz Hotel is set amidst the forests on the Carpathian Mountains, 1.5 km from Shayan. It offers classic-style rooms with free Wi-Fi access. Featuring a cable TV, all air-conditioned rooms come with heating and a refrigerator. Featuring a hairdryer, the private bathroom includes a bath tub or shower. Some rooms have a balcony or a terrace. The restaurant serves Ukrainian, European and Carpathian cuisine. The garden is complete with a children’s playground. Guests can relax in the shared lounge. A tennis court, as well as on site ski equipment hire facilities are available for guests. Wellness facilities, including a sauna and an outdoor swimming pool are available on request. Erney Laz Hotel is 1.5 km from the Shayan Bus Station. The Valley of Narcis in Khust is 17 km from the property. Offering a restaurant, Gnizdo Golubky is located in Shaian. Free WiFi access is available. Each room here will provide you with a flat-screen TV and air conditioning. Featuring a bath or shower, the private bathroom also comes with a hairdryer and a bidet. Extras include bed linen. 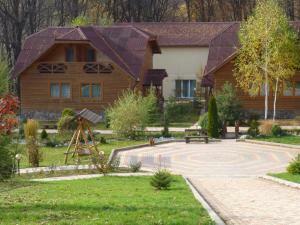 At Gnizdo Golubky you will find mineral water, barbecue facilities and a terrace. Guests can go hiking in the rural surroundings of the accommodation. Chorna Hora nature reserve is 37.7 km away. The property offers free parking. Offering a seasonal outdoor pool, barbecue and children's playground, Horinis is situated in Shaian in the Transcarpathia Region, 47 km from Baia Mare. Free private parking is available on site. Each room comes with a flat-screen TV. You will find a kettle in the room. Every room comes with a private bathroom. Extras include free toiletries and a hair dryer. Horinis features free WiFi throughout the property. Satu Mare is 44 km from Horinis, while Sighetu Marmaţiei is 43 km from the property. 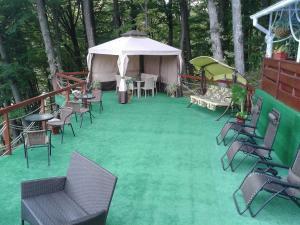 Shayanochka is located in Shaian and offers free WiFi and rooms with a terrace, a TV and a satellite TV. The property offers free parking. Complete with a microwave, the dining area also has an electric kettle and a dining table. Private bathroom also comes with a bath or shower. You can enjoy mountain view from the room. Extras include a barbecue, a desk and an outdoor seating area. At Shayanochka you will find a 24-hour front desk, a garden and barbecue facilities. Other facilities offered at the property include a shared lounge, a ticket service and an ironing service. An array of activities can be enjoyed on site or in the surroundings, including cycling, horse riding and hiking. Featuring free WiFi, Edelweis offers pet-friendly accommodation in Shaian. Guests can enjoy the on-site restaurant. Each room includes a TV. You will find a kettle in the room. Baia Mare is 47 km from Edelweis, while Satu Mare is 44 km away. Located in Shaian in the Transcarpathia Region, 47 km from Baia Mare, Zatyshok Hotel boasts a seasonal outdoor pool and views of the mountains. Free private parking is available on site. Each room is equipped with a flat-screen TV with satellite channels. Certain units feature a seating area to relax in after a busy day. You will find a kettle in the room. Each room has a private bathroom equipped with a shower. Extras include free toiletries and a hair dryer. 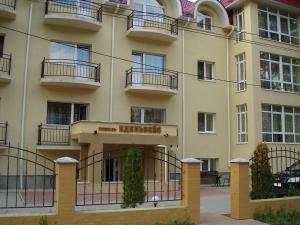 Zatyshok Hotel features free WiFi throughout the property. Satu Mare is 45 km from Zatyshok Hotel, while Sighetu Marmaţiei is 42 km away. Located in Shayan Mineral Water Resort village, 17 km from Khust Town, Chervona Ruta Lodge features free Wi-Fi and free barbecue facilities. It also offers a on-site restaurant. Each cottage at Ruta comes with a traditional rustic-style décor and air conditioning. All cottages have a flat-screen TV, and bathrooms are fitted with a hairdryer. Hungarian cuisine, as well as traditional Ukrainian dishes, are served in the on-site restaurant. Guests can set up a barbecue in the courtyard. Activities at Chervona Ruta include an outdoor swimming pool, horse riding and children's playground.Table tennis and billiards can also be found on site. Mukacheve Train Station is 84 km from Chervona Ruta, and a shuttle service to Uzhgorod Airport (130 km) is provided on request.